There is something amazing about watching a child learn a new skill. 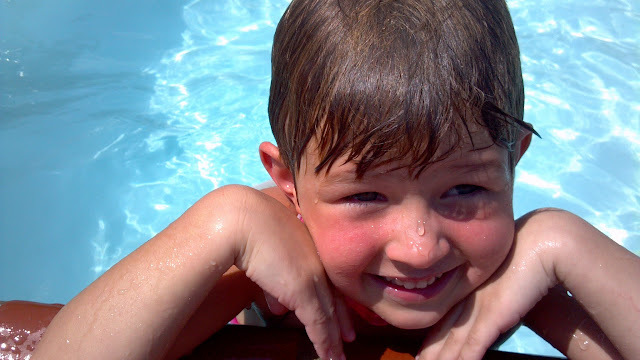 Teaching kids to swim is the most fun ever, in my opinion...outside of helping them learn to walk! Recently, Autumn has been making great strides in learning to swim without her floaties. She is fearless and can swim about 5-6 feet before she starts sinking. I was worried that she'd pass up Scarlett before too long. So, on Friday, I urged Scarlett to take off her floaties and try to swim without them. I said, "Scarlett, just trust me." She looked me right in the eyes and said, so seriously, "Ok, Mom, I TRUST you." She took off her floaties and took off like a fish swimming all over the deep end. Judging from her endurance level, she has been able to swim for quite some time! Trust, indeed! We had a "family party" that night to celebrate her accomplishment and the fact that we are all floaty-free. We made a yummy dessert and ate a special dinner together and gave three cheers (hip-hip-hoorays!) for our little swimmers. It's fun to stop and celebrate the little achievements of life together and to recognize the milestones as they pass. Sigh- that I never had any of those moments, learning how to swim floating free (yesterday I bought a noodle at Walmart), trusting my mom, even have her ask, and a celebration for my accomplishments. At least you're doing it right for your kids! What a fun reason to celebrate! Congratulations to both the girls! I still can't swim floaty-free! Maybe Scarlett and Autumn can come teach me :) Congratulations to both of them, and to you. Hope all is well with you all! how fun and an important accomplishment. I remember taking all three of my boys to swim lessons when I moved back to utah as a single parent. Now my oldest son Frank does pediatric water therapy with children as part of his physical therapy! I had such a great swimming teacher in my neighborhood that all my kids learned to swim when they were two or three years old. It's such a great relief once they know how to swim, especially living in California where nearly every home has a pool.